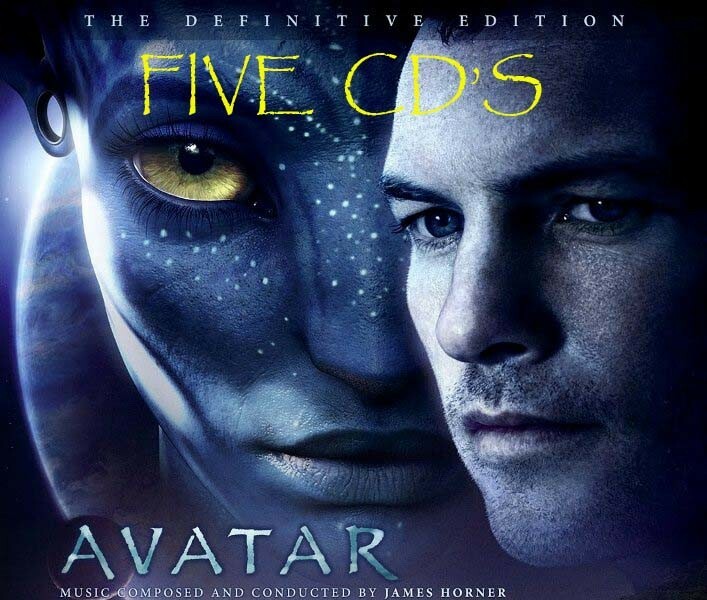 After browsing the net for the Avatar soundtrack I came across some various soundtracks that are available to buy, but I want to get your opinion on them, which are official merchandise, and which ones people have/would recommend. 20. Becomong One of "The People"
Avatar OST: 5CD Complete Soundtrack - commercially unavailable, promotional only? I can only find it being sold on eBay buy some guy who has sold tons of them so I'm not sure if it's legit or not. His feedback is good (even on the many 5cd sets he's sold) so not sure whether to risk it or not. Well how much is he selling it for? If it's low enough then it's worth it. See if you can get in contact with others who have bought it. That's a good idea actually, I think I will. He's currently selling it for £19.99 and £1 postage. The picture of the actual item looks pretty legit, with the Avatar logo on etc, but is it easy enough for someone to reproduce those and the booklets themselves if they have the right equipment? I know the album inlays are easy enough to make and there's a few different versions of these available for the 5cd set online, so I'm not too sure. When we look at the "cover" of the 5 disc set it seems rather home made to me. No sound track sold past the 1990's that I've seen states "FIVE CD'S". And the image used looks like a photoshoped version of the original movie poster. I meant the picture of the actual item, if you look closey the cover doesn't have 'Five CD's' on it, however! One of the people I contacted who had bought this item has brought more light on the subject. This Album from visualent isnt a genuine item. The CDs are Blank-Discs and are printed very good, the Covers, too. It were MPG-Coding Files. So for example MP3-Files. Prabably the Files that rotate in the internet! Therefore lossy and horrible in comparison with the original One-CD-Score! If you know a source for lossless Data, please let me know! So yeah, it is a fake with very good printing! Knew it was too good to be true. Where can I buy the Deluxe edition from, with the 2 CD's? I have looked for this but it's going for about £26, as far as I can see. The basic OST is only £4.49 so I don't know whether to just go for that and download the missing bonus tracks that the Deluxe version offers on CD2. Hmmm, decisions! If you can find the 2CD one then go ahead, but I bought the single CD and it does me just fine. Think I'll just get that one too when I get my next wage through! Bring on Friday hehe. I ask you to excuse my very bad English ! You can buy without hesitation with visualent, it's not a swindle and cd is very well. I was satisfied by my transaction(deal) with this salesman. I hope to have been able to help you! Well that's a bit confusing isn't it? Be carefull too. Some users who sell bogus items also have several accounts that they use to fool people with. Giving false possitive feedback in order to fool others. I never buy things on eBay. Too risky. I'm always buying stuff off there, mostly little things though like batteries and covers for phones. I'm wary when I buy other stuff like DVD's and CD's and bigger stuff, but I'm always careful to buy from top rated sellers or those who have shops. Never shop with anyone with less that 500 feedback or less than 95% positive feedback hehe. That's why I was thinking about going with this guy, but will wait to see what other feedback I get first and like I said before I'll probably just end up going for the original. Let's hope that this works out in your favour. the price can be acceptable!